If you’re like most women, there have been times in your life that you want to slim down, and we all want FAST results with fat loss! If you’re good at eating clean and exercising regularly, then you may be one of the lucky ones who can shed stubborn fat quickly. All it takes is a low carb diet and a calorie deficit for fat loss, right? But what if you’re not so great at food restriction? Or what if you eat good “most” of the time, exercise a decent amount, but the inches just won’t budge? This is where a supplement can really help with energy and fat loss, but it’s important to choose one that will be beneficial to your health overall and not just a quick fix with no longevity! 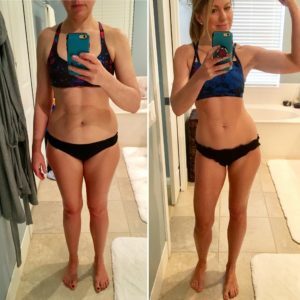 Over the years I’ve always been a pretty healthy eater, but now that I’m in my 40’s and my metabolism has slowed down and fat loss has become more of an effort, but I’ve found some effective products that deserve the spotlight! My top fat loss supplement is Pruvit’s Keto-OS Max, and make no mistake about it – ketones have EARNED their spot! Keto//OS Max is a powder you mix with water and drink 1-2x per day separate from meals (this is not a meal replacement or protein shake). 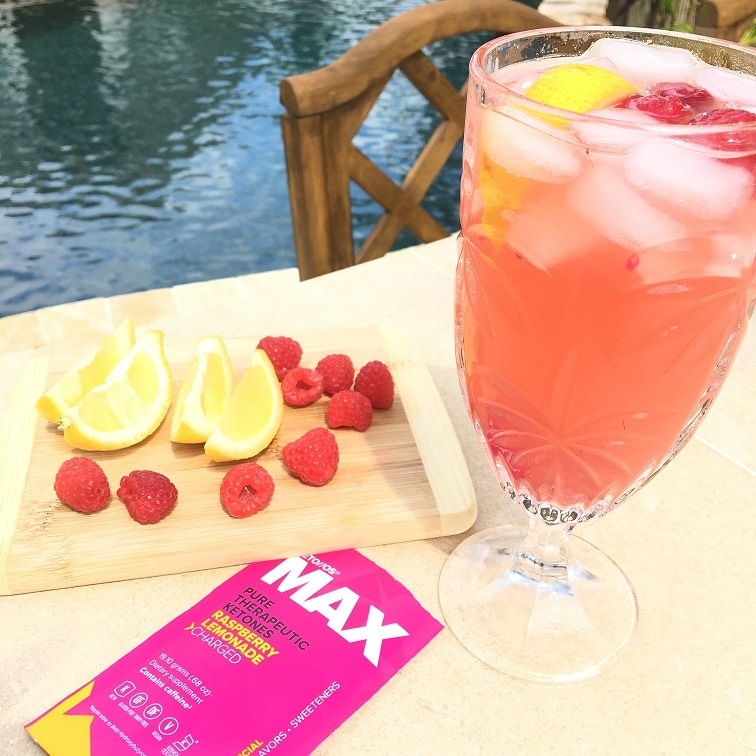 My favorite flavor is the Keto Max Raspberry Lemonade, but to be honest all the flavors taste good! I lost 17 lbs in a few short months, my mood is lifted, I have better focus, and I’m so much more productive. Even my skin and eyes are clearer! Before and better! Results may vary. I have been drinking ketones now for over two years and you can read more about my personal experience here and see my before and better photos! How many times have you started a fat loss plan and get things moving, only to gain it all right back? This is where ketones stand out from any other supplement I’ve ever tried! Drinking one serving of Keto Max biohacks your body into the metabolic state of ketosis in under an hour. It suppresses your appetite so it’s easier to eat smaller meals, and ketones are a fuel source so your body uses them as energy. When your body is in ketosis, it encourages burning fat for fuel instead of sugar and carbs (glucose). Keto//OS and Keto Max come in both a “Charged” version and a “Decaf” version. There are many other health benefits to supplementing with ketones such as better mood, better sleep, sustained energy, and focus! 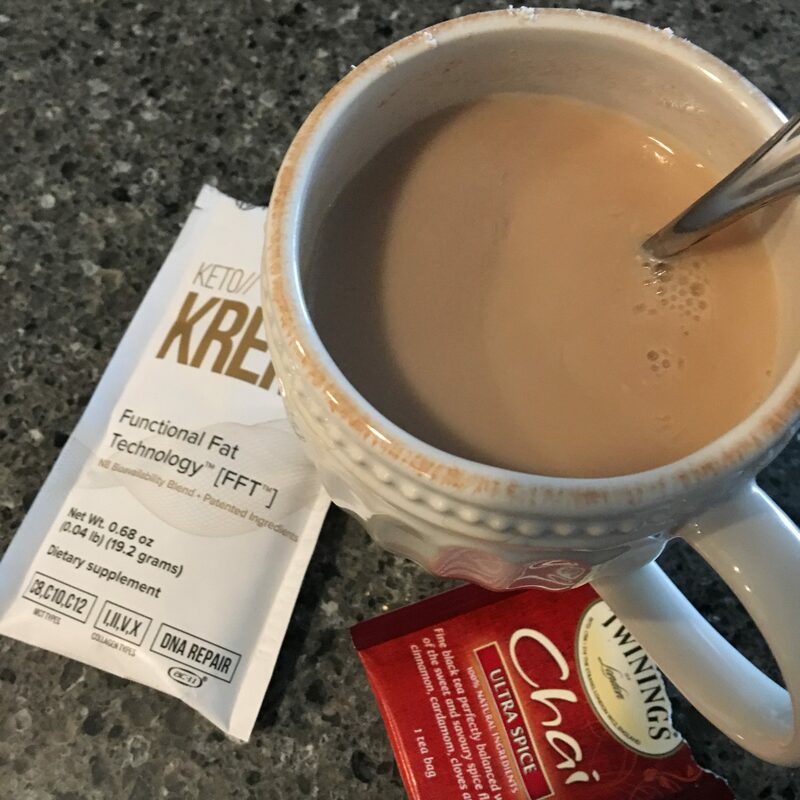 Pruvit’s Keto Kreme with *FFT is a companion product to drinking ketones, or can be used on its own to help your body burn fat and give your brain a boost of energy! The Kreme is a yummy, sweet (sweetened with Stevia and nothing artificial), creamy fat supplement powder that you can mix with coffee, tea, or even just make a shake with water and ice. I love mine mixed in hazelnut coffee or Chai tea! 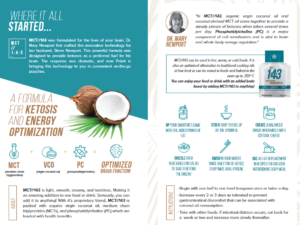 Keto Kreme contains MCT (medium chain triglycerides), coconut oil, and four different types of patented collagen proteins great for hair, skin and nails. Keto Kreme promotes ketosis, fills you up, and helps your body burn fat. MCT could very well be the healthiest fat source on the planet. It’s able to cross the blood brain barrier and get into your cells for immediate energy and a brain boost. How do I use the Keto Kreme? I start my day with coffee and Keto Kreme, or coffee + MCT//143 and fast until I get hungry, then drink my Keto Max. This is a great way to give your digestion a rest and get into a deeper ketosis to burn fat quickly. It suppresses your appetite like crazy! If you’re addicted to those chemical and sugar filled coffee creamers – try the Keto Kreme!! If you don’t like your coffee sweet, this next product is for you. 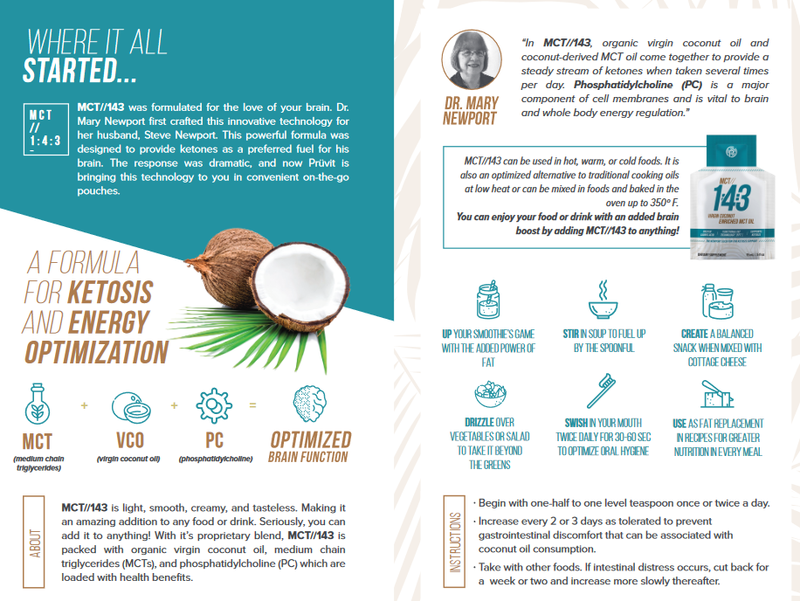 MCT is derived from the heart of the coconut and this super food has real super powers! The MCT’s in the MCT//143 are of the highest quality and made with a lot of integrity, and love! 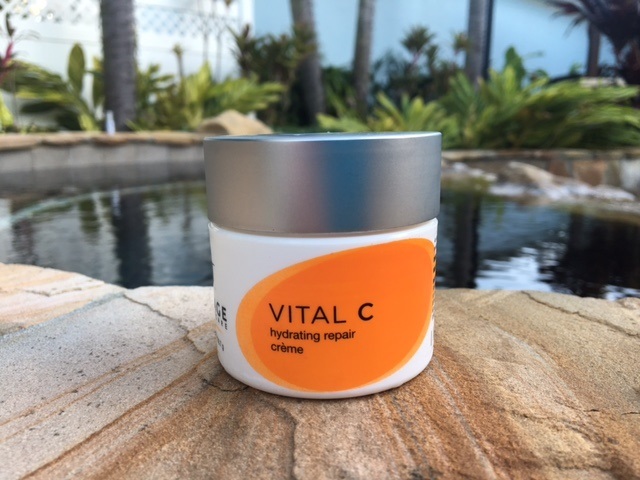 MCT’s kill bacteria that cause viruses, acne, fungi and candida and supports healthy brain cells. Dr. Mary Newport first crafted the MCT//143 in 2008 out of love for her husband, Steve Newport, who suffered from Alzheimer’s. Dr. Newport designed this powerful formula to provide ketones for his brain. 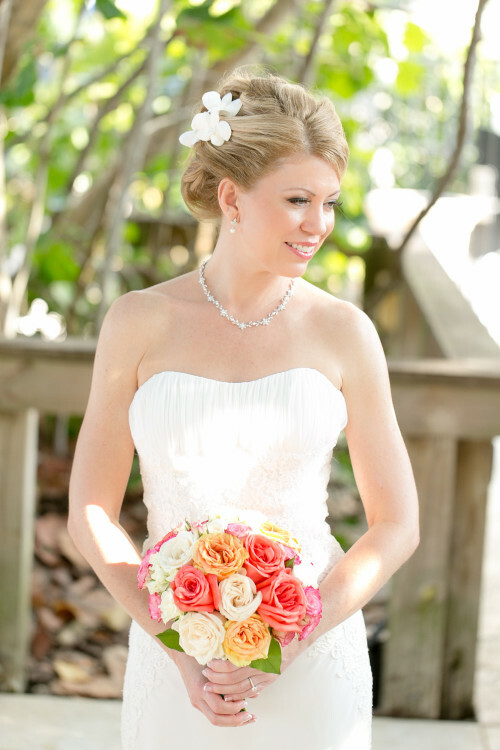 “143” means “I love you.” She improved his quality of life with the use of MCT and ketones. MCT’s are converted to ketones by the body, burned as immediate energy and NOT stored as fat, it encourages FAT LOSS by promoting ketosis. 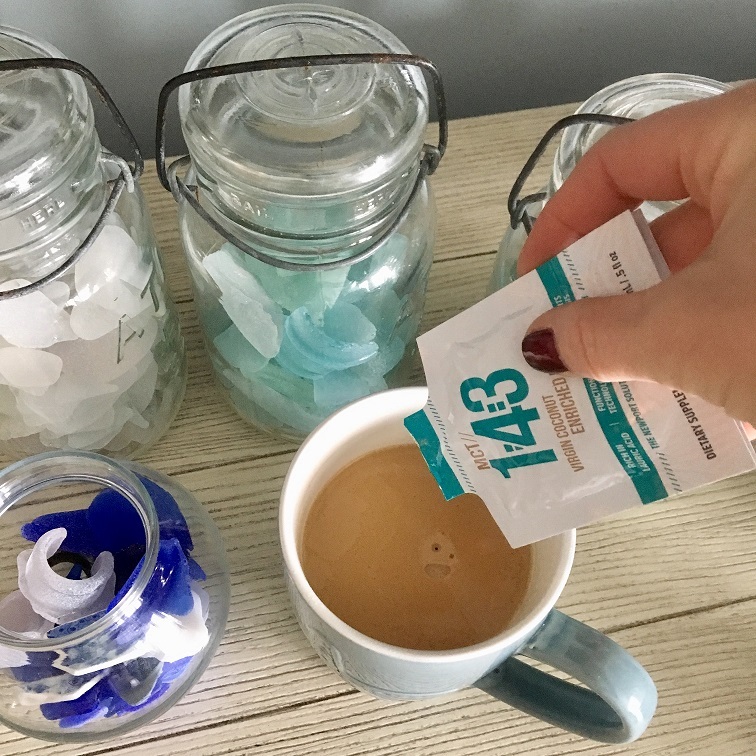 Adding a teaspoon of the MCT//143 right into your coffee can be a healthy addition to your morning! MCT doesn’t have a taste, and it blends very well – so well that you don’t even notice it. I even drizzle mine on avocado or salads. I mix this in with my coffee every morning without fail! Love the health benefits, and love how it makes me feel! Supplements are just supplements, we should use it with a diet or an exercise routine! Hi Miriam, you’re absolutely right. There are no magic pills but not all supplements are created equally that’s for sure. Ketones work like nothing I’ve ever tried, you should check them out, they are my #1 recommended fat loss supplement. 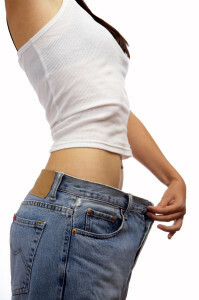 They make following a low carb diet much easier, which we all know is the formula for weight loss, right? Less carbs and sugar equals fewer calories creating an energy deficit. If you can lower your carb intake and move around (exercise) that’s a sure fire way of weight loss and fat loss. Thanks! Here is the most popular weight loss diet pill on Amazon. Let’s Check it out!!! My experience with MCT is pretty Good. This wonderful product give me energy throughout the day. I’m a big coffee lover so your #2 is something really interesting for me. I wonder if the taste is as good as you say. Definitely will give it a try. Hi Rachel. 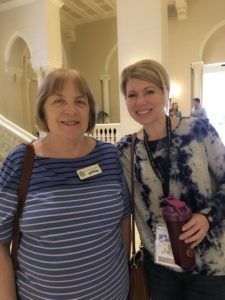 My experience with the KETO OS – 2.1 and 3.0 are different. The MCT’s in the 2.1 definitely give me more energy, don’t feel as hungry and give me a more ‘relaxed’ feeling throughout my day. The 3.0 does not do any of the above. From my experience with myself and others – you have to stick to the ketogenic diet or you will not lose weight. 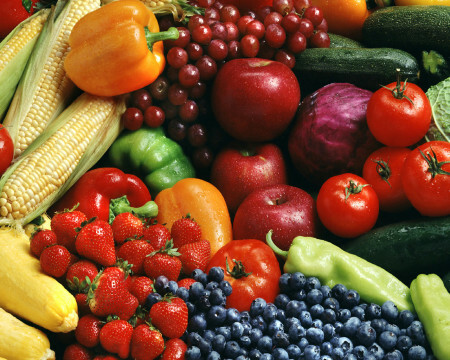 We are all different and I feel some people are losing weight, without following the strict diet, because any new healthy change can be rewarding in the beginning. I have just been using the 2.1 in my green drinks for the healthy MCT’s as my digestive system is very sensitive. I am a retailer and it is suggested to those who do have a sensitivity to start off slow and even mix the 2.1 with the 3.0. 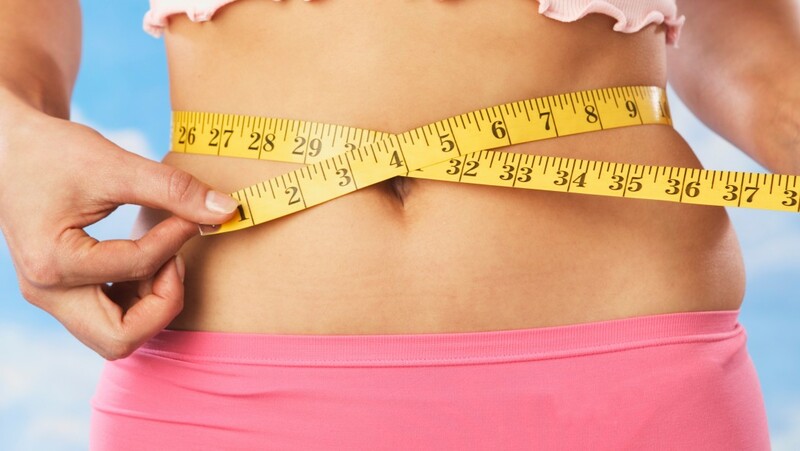 One can lose weight on the OS but it is out there to help us become fat burners instead of sugar burners and this can take time and lots of patience.